Wealthy German family which did much in the eighteenth century for the development of modern culture among the Jews. Born 1749; married Salomon; her daughter Leah became the wife of Abraham Mendelssohn and was the mother of Felix Mendelssohn Bartholdy. Born 1752; married David Friedländer. Born 1756; probably the Julius Eduard Hitzig whose son Georg Heinrich Friedrich Hitzig (born Berlin April 8, 1811; died there Oct. 11, 1881), the architect, built the Berlin Stock Exchange on the site of his grandfather Daniel Itzig's residence on the Burgstrasse (see Kayserling, "Moses Mendelssohn," p. 11, Leipsic, 1888). German banker; head of the Jewish communities of Prussia (1764-99); born 1722; died at Berlin May 21, 1799. Itzig was a member of the wealthy banking firm of Itzig, Ephraim & Son, whose financial operations greatly assisted Frederick the Great in his wars. He was also the owner of the large lead-factories at Sorge as well as of the oil-mill at Berlin, being one of the few Jews permitted to engage in such enterprises. In 1756 Itzig was appointed "Münzjude" (mint-master) by Frederick the Great, and again in 1758, together with his partner Ephraim. In 1797 Itzig became "Hofbankier" (court-banker) under Frederick William II. When the latter came to the throne he instituted a commission to examine into the grievances of the Jews and to suggest measures for their relief. Itzig, with his son-in-law David Friedländer, was appointed general delegate to that body. They had the courage to expose to the conference the cruel legislation of Frederick the Great and to refuse the inadequate reforms proposed (König, "Annalen der Juden im Preussischen Staate," p. 236). 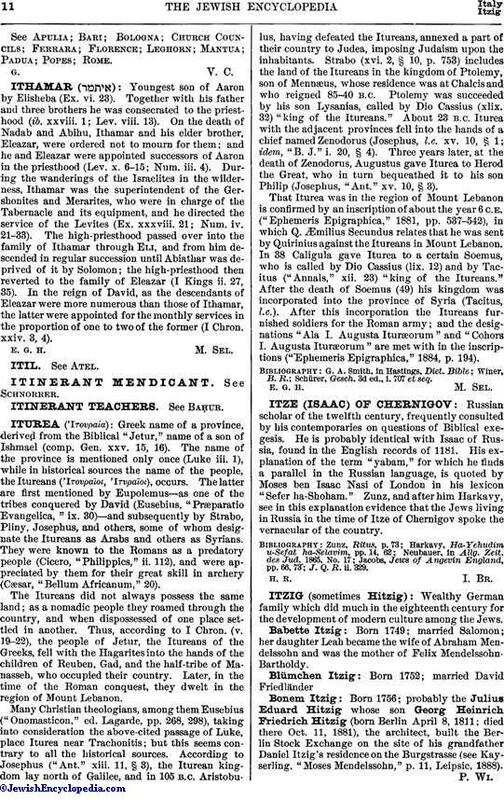 The Itzigs were among those granted equal rights with Christians, and an order was issued that they should not be classified as Jews in official documents. 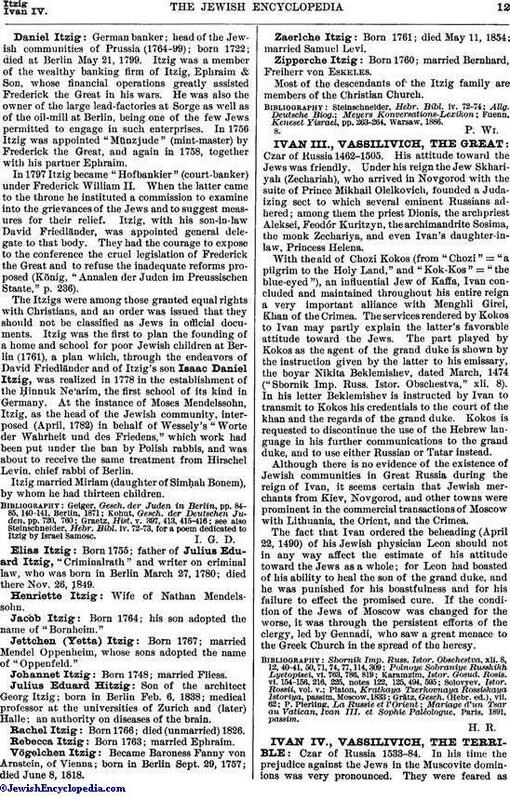 Itzig was the first to plan the founding of a home and school for poor Jewish children at Berlin (1761), a plan which, through the endeavors of David Friedländer and of Itzig's son Isaac Daniel Itzig, was realized in 1778 in the establishment of the Ḥinnuk Ne'arim, the first school of its kind in Germany. At the instance of Moses Mendelssohn, Itzig, as the head of the Jewish community, interposed (April, 1782) in behalf of Wessely's "Worte der Wahrheit und des Friedens," which work had been put under the ban by Polish rabbis, and was about to receive the same treatment from Hirschel Levin. chief rabbi of Berlin. Itzig married Miriam (daughter of Simḥah Bonem), by whom he had thirteen children. see also Steinschneider, Hebr. Bibl. iv. 72-73, for a poem dedicated to Itzig by Israel Samosc. Born 1755; father of Julius Eduard Itzig, "Criminalrath" and writer on criminal law, who was born in Berlin March 27, 1780; died there Nov. 26, 1849. Born 1764; his son adopted the name of "Bornheim." Born 1767; married Mendel Oppenheim, whose sons adopted the name of "Oppenfeld." Son of the architect Georg Itzig; born in Berlin Feb. 6, 1838; medical professor at the universities of Zurich and (later) Halle; an authority on diseases of the brain. Born 1766; died (unmarried) 1826. Became Baroness Fanny von Arnstein, of Vienna; born in Berlin Sept. 29, 1757; died June 8, 1818. Born 1761; died May 11, 1854; married Samuel Levi. Born 1760; married Bernhard, Freiherr von Eskeles. Most of the descendants of the Itzig family are members of the Christian Church. Fuenn, Keneset Yisrael, pp. 263-264, Warsaw, 1886.